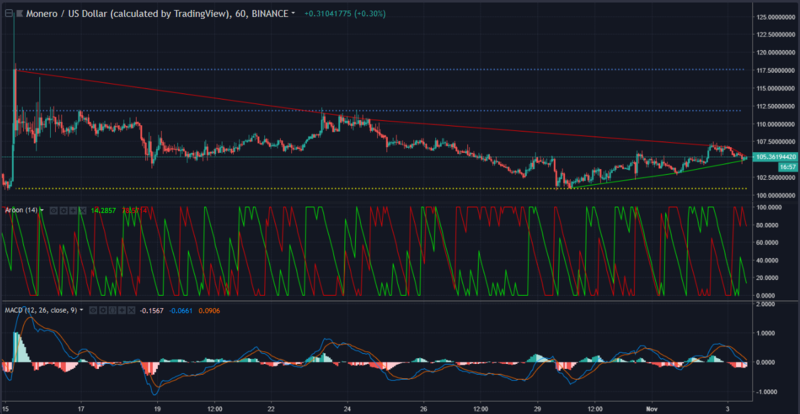 Monero [XMR], the famed privacy coin, has been observing tight trading in between set resistance and support levels. The long-term outlook for the coin is yet to be seen, as it has a strong community supporting its every move. The uptrend is visible on the graph from $100.9 – $103 – $105, with a downtrend from $117 – $110 – $106. Resistances are set at $117 and $111.8, with a psychological support holding the price up at $100. The Aroon indicator is demonstrating a trend reversal recently, with a potential uptick to be seen in the uptrend. The MACD is denoting a bearish crossover, as seen by the MACD line crossing below the signal line. The long-term outlook for Monero shows a support uptrend from $84.2 – $101 – $105, contrasted strongly by a downtrend from $292 – $106. Resistance levels are set at $115, $137 and $164, with supports at $84 and $99.8. The Relative Strength Index is in the center, denoting that the buying and selling pressure has evened out. The Relative Vigor Index is denoting a bearish crossover. The Parabolic SAR indicator is also flashing a bearish sign, as seen by the presence of the dots above the candlesticks. The bear seems to be out for prey with Monero, as the indicators unequivocally point to a bearish outlook for the coin. Support levels can be found at $100 and $98.